Miele are offering a great deal on steam combination cooking. 'Perfect roasting and baking every time'! 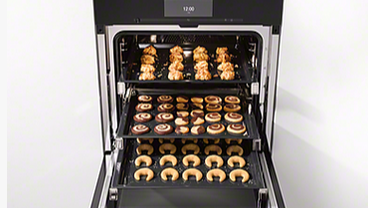 MultiSteam cooking enhances flavours and preserves the natural vitamins while avoiding oxidation and proving an even temperature throughout the oven cavity. With a range of functions and programmes, the Steam Combination Ovens provide automatic controls, menu cooking and a handy food probe. Frying, braising and gratinating just got better! 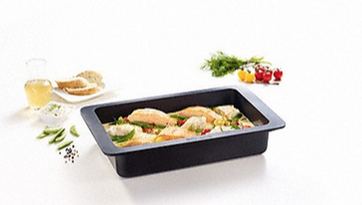 Made from die-cast aluminium and easy to clean the Gourmet Casserole Dish is perfect for oven and induction hobs. and place the oven dish directly on either side racks or FlexiClip runners. For those crunchy baked goods or crisp pizzas! 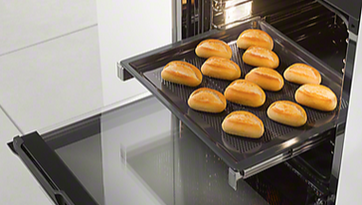 'Inspired by professional ovens' this Gormet Baking Tray can be paired with baking in Moisture Plus and incredibly easy to clean with the Perfect Clean finish. Designed to fit on the side racks, the FlexiClip Runners help to utilise several shelf levels. Easy clean with the Perfect Clean finish and helps to pull hot dishes away from the oven heat safely.